And have been for over forty years. so you can make the right choice of carpet for your home. Our, 'How you would want it in your own home,' attitude ensures the satisfaction of your family. Available in sheet or tile & plank form. The fantastic look of tiles, but much softer & warmer. No one knows Carpet like we do. We can help you chose the exact type and style of carpet to best suit your home and lifestyle. We have an extensive range of sleek, timber flooring options to completely change the look and feel of your home. Vinyl Floors combine function and style with a finish that is resilient as it is beautiful, perfect for the home well lived in. 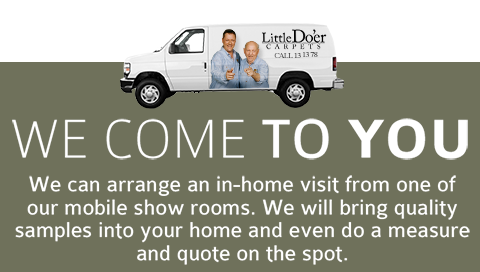 Little Do’er Carpets are floor covering specialists in Sydney and the surrounding areas. We supply and install carpet, vinyl and timber laminate/engineered flooring for both residential and commercial properties across Sydney. With more than 40 years’ experience in the industry, we have built an enviable reputation as Sydney flooring specialists due to our honesty, integrity and our professionalism. We go out of our way to make sure that our clients have the perfect flooring at a very competitive price. We not only service the metropolitan areas of Sydney, but we also service other suburbs, such as Bella Vista, Parramatta, North Shore, Burwood and related areas. Little Do’er Carpets are one of the leading flooring companies in Sydney, with a large range of carpets, suitable for very limited budgets right up to luxury standards. Whatever your flooring needs, we can arrange for our mobile carpet showrooms in Sydney to visit your property, measure your space and advise you on the ideal type of carpet flooring to suit your requirements and your budget. Engineered and timber laminate floors are a very popular and budget conscious solution for many homes and commercial properties in Sydney. Flooring needs change over time, but timber laminate is one of those flooring solutions that continues to increase in popularity over time. This is most probably because it is hard wearing, looks good and is very cost effective. Vinyl floors are coming back into fashion, but not as the old, cracked vinyl from the 50’s and 60’s. The vinyl flooring of today is of a far superior quality and can look similar to tiles or timber, unless you look very closely. These floors are less harsh on little feet than timber laminate flooring, are very low maintenance and come in a host of stylish patterns and colours.